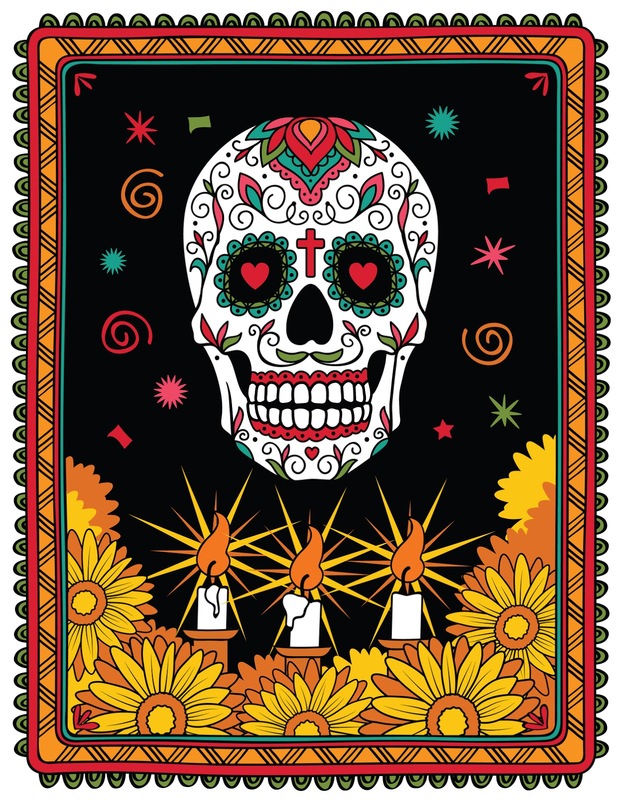 November 2 is Dia de Muertos, the Day of the Dead, in Mexico. Actually, it’s a multi-day holiday that spans from October 31 to November 2. It’s a holiday that has ancient roots dating back some 3000 years and was originally celebrated earlier in the year until the Spaniards conquered Mexico in the 16th century. They moved the date to fall in line with the Christian Allhallowtide. Most of see the imagery that is associated with the Day of the Dead, such as the painted skulls like the one at the top, and automatically equate it with our Halloween. Spooky and scary. But it is a much more benign and pleasant holiday, a celebration of the memory and spirit of our deceased relatives, a day to travel to cemeteries to eat and drink at their graves. The ancient belief was that that on that day each year the spirits would come back to visit their worldly ancestors. Being a person who loves to stroll through cemeteries among the stones and monuments, it’s my kind of holiday, more so than our Halloween. I find the calm and quiet of cemeteries to be comforting and not spooky at all. The names and words written about them on their stones give each the feel of a voice waiting to be engaged and I am often more than willing to stop to speak their name, especially the older stones where it is obvious that they are no longer visited by family members, if any remain at all. I get a feeling that simply speaking their name aloud once more brings them back to life in some small way, like a faint trace of mist appearing in the vast sky of our collected memory. That may seem crazy but that doesn’t matter. Nobody gets hurt and it creates a little peace for myself. And I think that’s what the Day of the Dead is about. That being said, here’s a video that might seem a little more Halloween than Dia de Muertos. But it is a song about love and attraction and that makes it more about this day. It’s Shakin’ All Over. I was going to play the original by Johnny Kidd and the Pirates or the great live version from The Who but settled on this version from The Guess Who, mainly because of it’s cartoon video with dancing skeletons. Feels like a fitting song for Dia de Muertos. Enjoy yours and remember the dead. That’s a well-done video. I love cemeteries, too. There are stories in those stones: no question about that. The ancient Egyptians believed that to speak the name of the dead was to make them live again. That’s why those pharaohs who didn’t tow the party line got their names chiseled off all their monuments. We just got back from visiting relatives down state and one of the things we did was to visit the cemetery. We’ve reached the unfortunate point where more relatives are there than elsewhere.